Days Inn - Amman is strategically located in the bustling city of Amman, nestles between the commercial, entertainment and shopping district. Twenty-five minutes away from Queen Alia International Airport and ten minutes drive to Amman Airport. 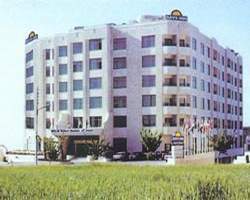 Days Inn - Amman lavishes tourists and frequent international travelers with spacious and comfortable accommodation, which range from standard rooms to executive suites and suite apartments with kitchenette for extended stay guests. Private bathroom with toilet, Colour television with satellite, Hairdryer, Room service 24h, Radio, Kitchen corner, Air-conditioning, Direct dial phone, Balcony (in some of the rooms), Minibar, Safe, Movie channels. The Day Inn Hotel has full leisure facilities including an Outdoor Pool and fully equipped Gym, Jacuzzi, Steam and Sauna Room . In house guests may use the above facilities free. For the dining experience we have two specialty Restaurants. The Bistro Restaurant is open daily for Breakfast, Lunch, and Dinner. For a Mediterranean flavor with a spice of entertainment our Cali Bar and Restaurant is the happening place. 3 Meeting Rooms. The maximum number of people in largest room is 300 and all rooms is 330. Banquet Style has a maximum of 300 people. Convention Centre available. Boardroom and Conference rooms with High Speed Internet access.